Will a modern twist succeed under the direction of Tim Burton? As Cptn. Leo Davidson heads out into space to rescue a chimp, he gets sucked into a time travelling storm and crash lands on a planet run by apes. As a rebirth of the franchise almost thirty years after the last film, the most notable change is the improvement in visuals and how much better the apes now look. To top this off the highly realistic looking main villain, General Thade, is absolutely fantastic to watch as he carries a scarily animalistic persona by panting and frowning throughout, and coming across as a very formidable enemy. Gone are the almost comical apes of the sixties/seventies as we see a much darker tone as expected with Tim Burton creations. While this tone helps move the franchise into a new era visually, the other characters mostly leave a lot to be desired and lack any standout personalities to take control of the film and the viewer’s interest. As the lead Mark Whalberg typically doesn’t show much emotion, particularly towards other humans, and then makes a fairly weak attempt at being cold hearted and selfish towards the end with remarks falling flat left, right and centre: “Look, you gotta make your people understand. It’s over. There’s no help coming.” Even Helena Bonham-Carter’s human-friendly ape character doesn’t really impact or compete with Zira, a comparable ape from the first films. Despite this, the action takes a much-needed step in the right direction with proper battles and a serious army and villain to contend with. And this is an even greater relief since the final few films saw fight scenes take a back seat. This film offers quite a new perspective to the original like new apes that are a force to be reckoned with and a story that focuses away from just the lead. Also, as it’s a loose remake it manages to refresh the franchise without having to weigh the film down with lots of explanations and new introductions. 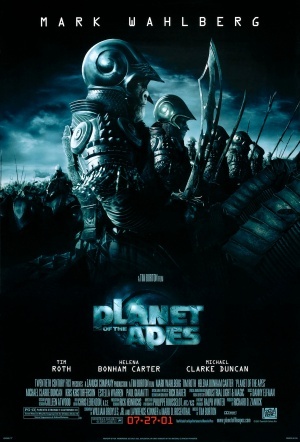 The Planet of the Apes is an attempt at modernising the franchise and drops the raw visuals and minimalistic story that we've seen previously; the result is a much darker instalment with a superbly wicked villain, but unfortunately it develops its own glass ceiling due to a lack of personality provided by the human characters.